We started our management company in 1999 starting with our own real estate holdings and growing to including managing other properties also. As a company, we hold memberships with the National Association of Realtors®, California Association of Realtors®, San Diego Association of Realtors®, Vacation Rental Managers Association, San Diego County Apartment Association, and the Better Business Bureau. 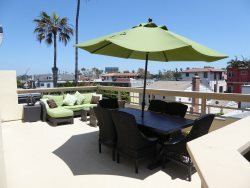 We focus our management on the nicer and more upscale vacation properties in the Mission Beach and Coastal areas. When requested, we offer guidance to property owners on the selection of furnishings and décor to help make certain your property garners the greatest rental return. Rentals are restricted to the primary responsible occupants being age 28 and above to assist in the protection of your investment. Because vacancies are expensive for both of us, we make every effort to keep our vacancies to a minimum. Properties are advertised on trending vacation rental sites and our new reservations system allows clients to secure their vacation 24 hours a day. Give us a call, we would be happy to speak with you about our services. JJ has more than 35 years experience in real estate management, sales and construction. He enjoys building custom homes and remodels, and currently resides in one of his own beautiful creations. In addition to acting as managing broker for the business, JJ oversees our maintenance crew and is hands down the best person to keep things running smoothly at the beach. In his spare time JJ likes to tinker in mechanics, wood working, and home improvement. Cheryl Ann has been actively involved in real estate sales and management since 1985. She and JJ founded PSG in 1999 after a search for a viable management company for their own holdings yielded no satisfactory results. Cheryl Ann is the face of Pacific Sunset Group and oversees the management of the business as well as supervising the accounting/bookkeeping. In her spare time Cheryl Ann likes to garden fresh herbs & vegetables, design and completely dominate in FreeCell.